Did cubism inspire engineering analysis? A few weeks ago we went to the Tate Liverpool with some friends who were visiting from out of town. It was my second visit to the gallery in as many months and I was reminded that on the previous visit I had thought about writing a post on a painting called ‘Bottle and Fishes’ by the French artist, Georges Braque. It’s an early cubist painting – the style was developed by Picasso and Braque at the beginning of the last century. 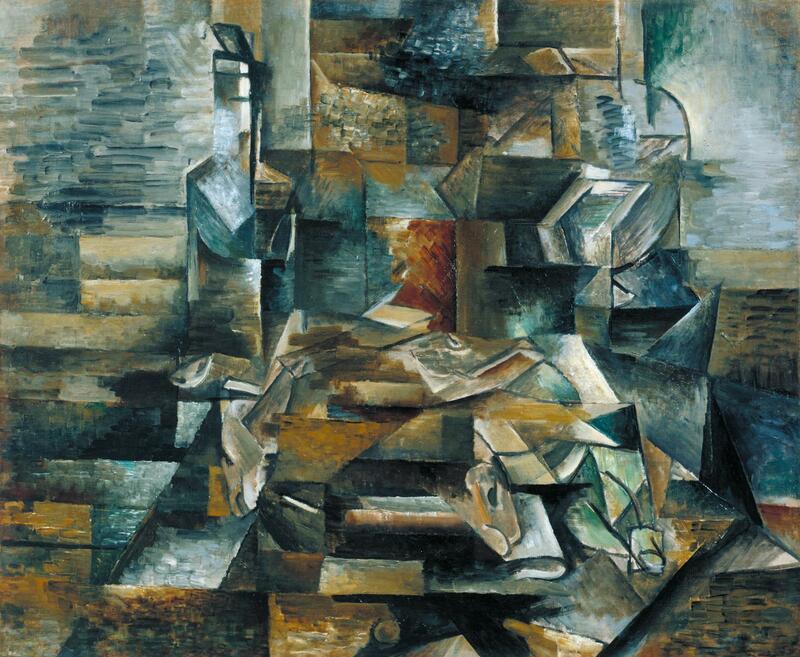 The art critic, Louis Vauxcelles coined the term ‘cubism’ on seeing some of Braque’s paintings in 1908 and describing them as reducing everything to ‘geometric outlines, to cubes’. It set me thinking about how long it took the engineering world to catch on to the idea of reducing objects, or components and structures, to geometric outlines and then into cubes. This is the basis of finite element analysis, which was not invented until about fifty years after cubism, but is now ubiquitous in engineering design as the principal method of calculating deformation and stresses in components and structures. An engineer can calculate the stresses in a simple cube with a pencil and paper, so dividing a structure into a myriad of cubes renders its analysis relatively straightforward but very tedious. Of course, a computer removes the tedium and allows us to analyse complex structures relatively quickly and reliably. So, why did it take engineers fifty years to apply cubism? Well, we needed computers sufficiently powerful to make it worthwhile and they only became available after the Second War World due to the efforts of Turing and his peers. At least, that’s our excuse! Nowadays the application of finite element analysis extends beyond stress fields to many field variables, including heat, fluid flow and magnetic fields. This entry was posted in Soapbox, structures and tagged art, Braque, Engineering, finite element analysis, fluid flow, heat transfer, magnetic field, mechanics, Picasso, structural integrity, Tate Liverpool on January 25, 2017 by Eann Patterson. It is an interesting thought to parallel Finite Elements to the Cubism reduction! Engineers also follow the Early Greek philosophers who recognized the cube as one of the only five possible Platonic Bodies, and Kepler succeeded in deriving the radii of the planetary orbits through a sequence of these five bodies – in a search for symmetry and perfection. Interesting connection between humanities and engineering, although FEA is a totally new bit of knowledge to me. Wikipedia writes that it can be used to analyze “pipe lines.” Thus, I hope U.S. petroleum and pipe engineers are masters of FEA, since our new President has decided that all oil pipelines which Obama put a hold on, for environmental and cultural reasons, now have a BIG thumbs up and green light to proceed and desecrate the landscape, to which one politician replied, “Yes, drill baby drill.” Aside from that, I wondered if an FEA type of process could be used to breakdown and analyze structural social problems, for example inner city unemployment, or entrenched poverty. So basically you mean taking an object, situation or problem perhaps and getting to the core by breaking down each component. Very interesting!